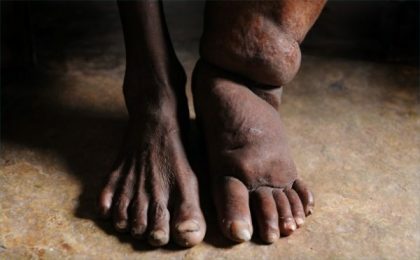 Lymphatic filariasis (LF), a parasitic disease commonly known as elephantiasis, continues to be a public health problem in parts of India. A team of Indian scientists, working with collaborators from the World Health Organization(WHO), evaluated the efficacy, tolerability, and safety of ABZ and DEC used for mass drug administration for populations susceptible to Lymphatic Filariasis which is caused by roundworms. Mosquitoes carrying the infectious roundworm transmit it and affect people. The team led by Dr. Nilima A Kshirsagar of Seth GS Medical College and KEM Hospital, Mumbai compared the efficacy and safety of a three-year treatment programme of a single annual dose of DEC and ABZ with a single annual dose of DEC in people from two villages, Kurzadi and Selukate in Wardha, Maharashtra. They have found the treatment was safe and that there was no difference between the two prevention protocols. The research team included N.A. Kshirsagar, N.J. Gogtay, V.S. Kadam, P.A. Thakur, A.Gupta, and D.D. Rajgor of Seth GS Medical College and KEM Hospital, Mumbai, B.S Garg, P.R. Deshmukh, and N.S. Ingole from Mahatma Gandhi Institute of Medical Sciences, Wardha and JK Lazdins-Helds from Special Program for Research and Training in Tropical Diseases, WHO. The results of the study have appeared in journal Parasitology Research. The article first published in India Science Wire has been reproduced with modification of heading.